Our medicinal marijuana seed category contains a selection of seeds perfectly suited for the cultivation of medicinal marijuana. One of the characteristics of medical marijuana is the relatively high level of CBD in relation to THC. Research has shown that CBD can help in case of epileptic seizures, anxiety and rheumatic symptoms. Furthermore, CBD has the ability to reduce the psychoactive characteristics of THC and thereby increase the clearness of the high of the seeds from this category. Preferably, this high CBD level is combined with a high THC level, the best is a ratio of 1:1. For the best result when growing medicinal cannabis seeds, give the same treatment to the seeds during germination and growth as regular cannabis seeds. 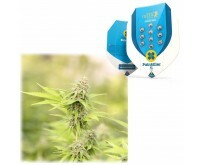 If you would like to buy medicinal cannabis seeds, in this section you will find marijuana seeds especially suitable for medicinal cannabis use. Therefore, buy marijuana seeds with CBD from the Dutch-Headshop. Discreetly packed, shipped and delivered quickly!